I fought against multiple attempts by the Republican Party to weaken or eliminate the Citizens Initiative process. Why is the Republican-led Legislature afraid of the people? 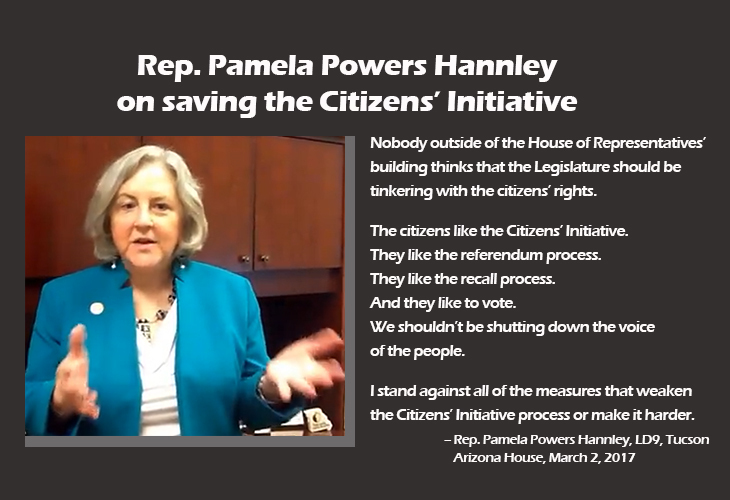 The progressives who wrote the Arizona Constitution gave the Citizens Initiative to the people; the Republican Party has no right to take it away. I supported returning transportation funds (HURF) to local control. When the Legislature starves local governments, it leads to crumbling local infrastructure and increased local taxes to fill the income gap. It’s time for the Legislature to give local governments their fair share. I voted against using taxpayer funds to pay for private and religious school education, through the expansion of Empowerment Scholarship Awards (ESAs). In addition, I fought for increased funding for K-12 public education, JTED, community colleges, and the universities. Improving access to quality education is the surest way to lift our citizens out of poverty and to build Arizona’s economy. 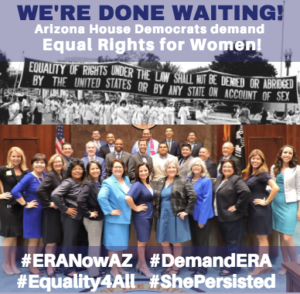 Arizona House Democratic Caucus fully supports ratification of the Equal Rights Amendment (ERA). I proposed ratification of the Equal Rights Amendment (ERA). In 2017, House Judiciary Chair Eddie Farnsworth and Senate Government Chair John Kavanagh tried to kill the ERA by refusing to hear it in committee. House Democrats used a parliamentary procedure to bring the ERA up for a vote. This sparked a lively debate on equal pay for women on the floor of the Arizona House. Ratification of the ERA was proposed in eight states in 2017. Since Nevada ratified the ERA this year, we need only two more states to ratify it before the ERA can be sent to Congress for enactment. Arizona, let’s make history in 2018 by standing up for equal pay and equal protection under the law for women. Again, what are the Republicans afraid of? I voted against all bills to decrease worker protections, pensions or benefits. I was one of the only Legislators who voted against changing the Arizona Constitution to enable reduction in benefits for workers. I fought for restoration of cash assistance and childcare subsidies for needy families. Arizona is the stingiest state in the country with cash assistance for the poor. Our state will not dig itself out of its own economic doldrums as long as we continue to ignore children and families living in poverty. I voted to increase teacher pay. I proposed a bill to offer addiction treatment instead of jail for people who call 911 during an overdose situation. Again, as with the ERA, House Judiciary Chair Rep. Eddie Farnsworth tried to single-handedly kill this Good Samaritan bill. Luckily for addicts and their families, this bill appears to be a priority for 2018, as opioid deaths continue to rise in Arizona. I’m hoping we can pass this out of the Health Committee in 2018. I proposed adding new Spice ingredients to an existing Republican drug bill. As a result, dozens of compounds were added. The bill passed and was signed into law. I proposed a bill requiring healthcare providers and institutions to reveal religious beliefs that would stop them from providing legal drugs or medical procedures. Patients– particularly pregnant women– need to know upfront what legal services or medications are available when they are shopping for care. I voted against fetal resuscitation and will continue to fight for the rights of women to control their own bodies and to make their own medical decisions. I proposed a bill that would raise standards and require additional training for home health workers. Arizona has some of the lowest training requirements for home health aides; consequently, it is not surprising that elder abuse complaints have risen dramatically. It’s time that the Arizona Legislature opened its eyes to the needs of our Seniors. I proposed a bill that legalized death with dignity and outlined a process for patients, family members and physicians to follow. I proposed a bill that would lengthen the renewal period for a medical marijuana card from one year to five years. Arizona has one of the most expensive and complicated medical marijuana programs in the country; we have a medical marijuana program for people who can afford ~$250/year for a card renewal and the required doctor’s visit. This high annual renewal cost pushes poorer citizens to buy marijuana illegally on the street. Marijuana — a plant that never killed anyone— is a safe alternative to dangerous prescription painkillers for some patients. Let’s make it affordable. Perhaps we could save lives in the process. I voted against all bills that would have increased pollution, harmed the water supply, decreased environmental protection, or destroyed public parks and natural monuments. It’s common sense to protect our water supply and our state’s natural wonders– and our planet. I proposed a bill to expand Clean Elections to county supervisor races and unpaid boards, like the school and water boards. The maximum individual donation in the county supervisor’s race is $6250 (thanks to a late-night Republican vote a few years ago). That’s obscene. If you look at campaign finance reports for the 2016 Pima County Supervisors’ race, you can see a proxy bidding war between the few local folks who can afford to donate $6250 per candidate. In contrast, the maximum individual donation to a “traditional” privately funded Legislative candidate is $5000 (also increased by the Legislature recently). For Clean Elections candidates, it is $160. Do you want rich folks and special interests to continue to control local and state elections? I strongly believe that our local, state, and federal governments would be more responsive to the people if big-money politics and special interests were not controlling the elections game. When people run clean, they vow to accept only small donations from real people– not from political action committees (PACs), not from dark money donors, big corporations, or unions. Only real people– not corporate people– can vote. It’s time that real people– not money– controlled our government. Money is destroying our democracy. Clean Elections levels the campaign finance playing field and strengthens the voice of the voters, by diminishing the voice of money in politics. The Sierra Club gave me an A+ rating for voting to protect our home– the Earth. The Secular Coalition honored me as a Secular Star for standing up for religious freedom (even for the non-religious). The Children’s Action Alliance gave me a 100% rating. The Pima County Interfaith Council (PCIC) recognized my work on the Spice and street drugs. I had perfect attendance and didn’t miss any votes. You can read news articles and other background information here. It has been an honor to serve you in the Arizona Legislature. I hope you will support by re-election in November 2018. The people’s work is not done. Please help me by signing my petition, donating $5 for Clean Elections, or donating seed money by check or PayPal. Watch for events and updates on Facebook and my blog. Let’s do this. 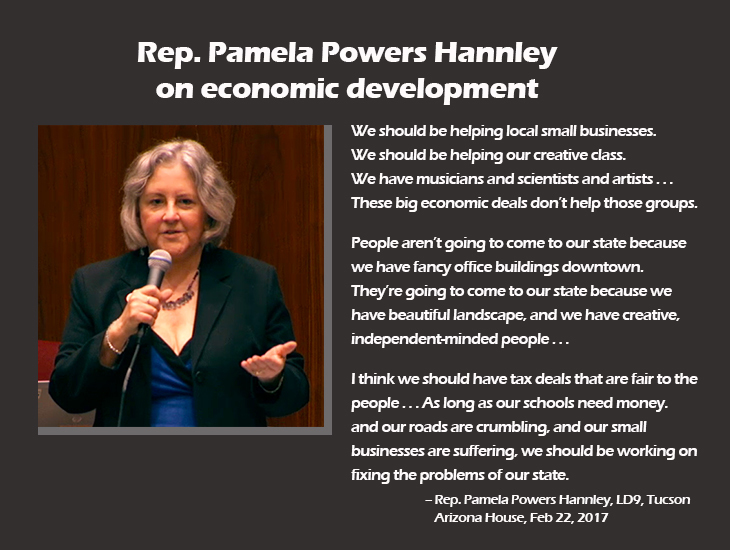 Here is an excerpt from the speech in which I announced my candidacy for the Arizona House. Pretty thin gruel. What did you get done? You couldn’t identify one problem in 20,000 pages of statutes that you could actually solve, not fight to solve? You talk about our “starving” local governments. What planet are you living on? Do you know where our city governments rank in terms of expensiveness? You know our schools are relatively inexpensive. Ever wonder why you never hear about how expensive our city governments are? Ask the Council of State Governments to get a ranking for you. I had the pension system do the same beneficiary to the same beneficiary comparison. The average city employee in that year saw an 11% pay increase that year. That may have been a while ago, but cultures don’t change easily. The City of Phoenix has a forest of people making more than $150,000 per year. Tucson tries to keep up with them with over 200 workers making more than 100,000 per year and almost 5,000 employees total, yet it says can’t afford the minimum wage workers to fill the cracks in streets with tar. It would only take about 18 minimum wage 3 man crews to do the 4,700 or so miles of Tucson streets in a year. With over 200,000 miles of unfilled cracks, it’s obviously not a priority for Tucson city government. The effect of not patching the streets has been devastating for Tucson, people don’t want to live there. There are fewer people living in Tucson today than ten years ago. Where is the Signed Law where AHCCCS goes back to paying ADULT Dental Care???? None. The Republicans see to that by setting the agendas for all committees. If Democrats propose bills the Republicans (or their voters) like, Republicans propose those bills the next year– rather than work in a truly bipartisan way. The Spice bill did pass with my suggested changes. I also proposed three other bill amendments which Republicans agreed to– two insurance bills and one that would have negatively impacted state workers. Besides voting and speaking out with the people in mind, my big contribution in 2017 was stopping or amending some really bad bills. I am proud to say that I was part of a bipartisan urban/rural, Libertarian/Progressive group that stopped nearly every corporate welfare bill in 2017. We saved the state millions if not billions in tax giveaways. If big corporations want a better educated workforce, perhaps they should take their fingers out of the state’s cookie jar. What D bills were run (stolen) be Rs last session? Ducey’s teachers’ college idea with free tuition for would-be teachers who make a commitment to teach here was part of Fred DuVal’s campaign. There are three 2017 Dem bills that are rumored to be in the GOP stack for 2018. The reality with the one party dictatorship is that they bow to their corporate masters and don’t give a hoot about the average person in this State. ALEC, Goldwater, and the Koch Brothers, and DeVos’s private, for profit pals run this State. The key to getting representative government is to get money out of politics. You may be correct but I don’t see it happening any time soon. Too many people – including little guys like me – want to have the ability to guide their money in the direction of like minded candidates. It is kind of a basic desire among contributors to candidates here in the United States. Just out of curiosity (because I don’t know) is there any country in the free world that eliminated campaign contributions in order to get money out of elections? I don’t know about clean elections around the world, but just as with healthcare, prescription drugs, incarceration and the military, the US wastes far more money on running for office than any other country. In Britain, the election cycle is ~90 days. Wouldn’t that be lovely? Congressional candidates and electeds spend 2-3 hours per day dialing for dollars. That is a broken system. The Arizona and Tucson Clean Elections systems allow eligible voters to donate modest sums but don’t allow corporate, Union or political action committee donations. Take a look at my fiance reports and tell me who my corporate masters are. Then explain my near identical votes during my first few terms, when I ran as a Clean Elections candidate. Better yet, just drop your conspiracy theory idiocy. Disclosed financial reports? Hysterical! The amount of disclosed money spend on campaigns for the legislature, DECREASED in 2016. Of course millions of undisclosed dark money spend on legislative campaigns, INCREASED dramatically in 2016. We all will be more impressed John, if every ” uncoordinated” special interest dollar spent on legislative races was disclosed 10 minutes after it was made. No legal reason to not disclose. If all your moneyed pals are so proud of their “speech” disclose at the source, not their money laundered “Citizens for Real Nice Stuff”. One of your fellow Senators had thousands of dark money spent on his UNOPPOSED reelection campaign. I will praise you to high heaven on the day you get complete dark money disclosures passed in this State. But I will bet anything you will never make it happen. Nice dodge. Now look at my reports and get back to the blog. And dont forget to explain my conservative voting record when I ran Clean. I guess $36,000 of dark money spent in your behalf by Cathy Herrod, and her anti choice allies, and Betsy DeVos’s for profit school groups don’t count, especially for someone running with no opposition. Ooops. I meant finance reports and not fiance reports. Don’t tell my wife. Senator, your dodge is disingenuous here. You have been the beneficiary of thousands and thousands of dollars from Dark Money campaigns. You have corporate masters… you just don’t like having that fact made public. of all the bills you proposed how many were passed into law? please name the bills.